From the Color Scheme panel you can select one of the color pre-sets that control how the different values of Color Temperature and Brightness are displayed on the screen. Each pre-set color scheme will change the appearance of the screen whilst maintaining the same Color Temperature. This is useful in controlling transition duration and blue light reduction. 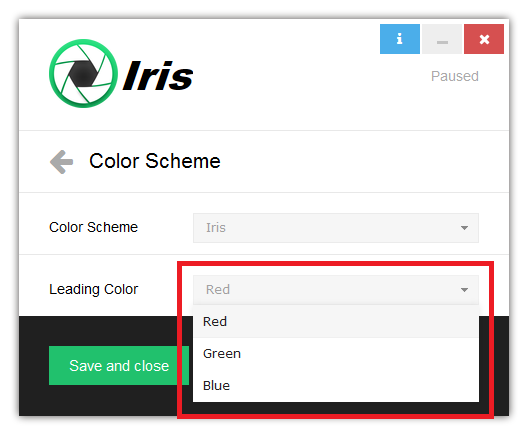 You can select different color schemes from the Color Scheme dropdown menu. Iris is the default color scheme which I have measured with various devices and is the closest to the real color temperature of most light sources. It has gradual interpolation through all values and has reduction of both blue and green color in the lower values. It looks orange in the high values and red in the low values. Magmus is a color scheme with faster transition to red color. 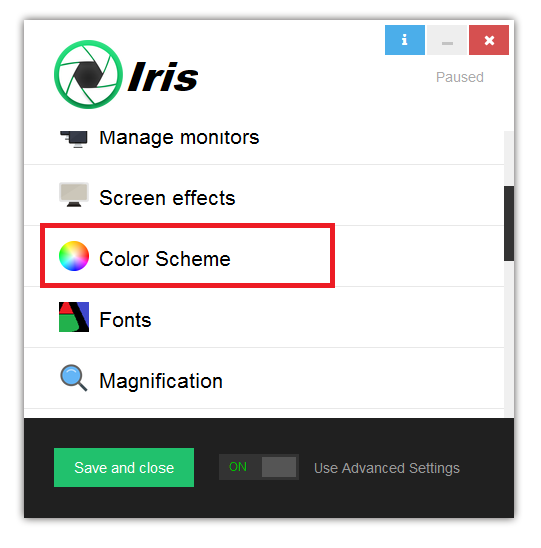 It shifts more quickly than Iris to the red values of the color spectrum and also has both blue and green color reduction. Magmus is the best color scheme for biohackers. 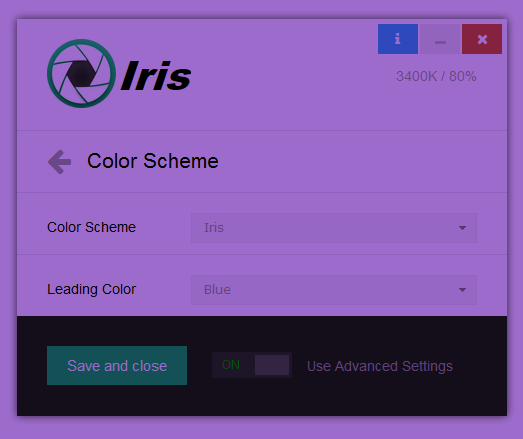 Users have reported that the colors of Iris are markedly different from the values of the popular software f.lux. The reason for this is that f.lux prioritizes better sleep through blue light reduction over visual appearance. Olaf is my attempt to add more yellow to the f.lux values. If you like f.lux but need more custom control, Olaf provides a compromise solution. Groot does something that no other blue-light reduction software does. You can see how colors are more green with Groot. The reason for this is that Groot doesn’t care about Color Temperature, instead it just gradually removes blue light. All other schemes remove both blue and green colors in lower values. Groot removes only blue color and blue light and you will still see green just fine. 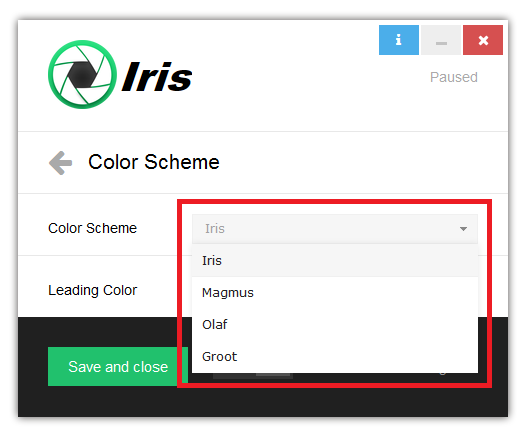 As you can guess, I use the Iris color scheme, but some people like Magmus, some like Olaf and some like Groot. Experiment and find the best scheme for you. 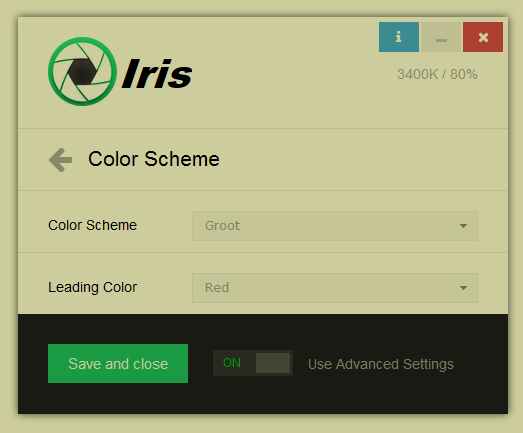 Aside from this, you can also change the leading color for each color scheme from the Leading Color dropdown menu. The Leading color is the color which doesn’t change when you reduce the Color Temperature. This is just for experimenting with the effect on light on human biology and most people will not use it. Don’t use the blue leading color if you want better sleep. Science says that high amounts of blue light reduce the secretion of your sleep hormone Melatonin.